Over two decades ago, Sally, the wife of Hon. Frank Feldhaus, was attending numerous events where the National Anthem and Pledge of Allegiance were a staple of any public event. While Sally Feldhaus was honored to pay respect to our nation, she noticed something troubling. The traditions of singing along, taking your hat off, and simply showing pride in our country had given way and had nearly vanished. Rather people were chatting with one another during these ceremonious acts of patriotism. At that moment she new that she might not be able to change the generation that had fallen away from these traditions, but she could certainly try and instill a sense of pride in ones country and try and instill these traditions in our youth. Sally, a women of action, quickly formed a committee of citizens that would put together an event that would honor our Flag. Flag Day, was first established in 1916 by President Woodrow Wilson through the establishment of a proclamation which officially denoted June 14th as a Flag Day. 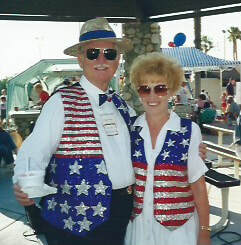 Through Sally Feldhaus and the committee, Anaheim's first Flag Day was celebrated in 1996. 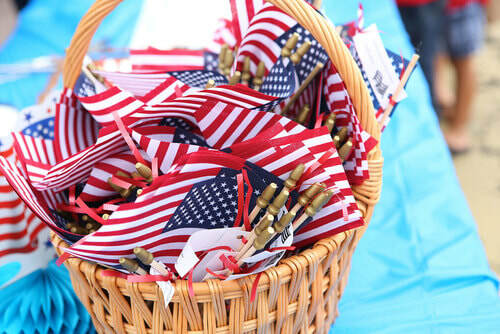 One of the main staples of the event was the "What the American Flag Means to Me" essay contest where over 42,000 Anaheim student wrote letters of what the flag meant to them. Essays were filled with narratives of the flag which demonstrated the symbolism of our freedom, loyalty, justice as well as the American principles that the country stands for. The first and second place essay contest winners were invited to walk in the Anaheim Flag Day Parade along with elected public officials, community organizations, and public servants. Now in its 24th year, this Anaheim Flag Day Celebration will be held Sunday, June 9th from 1 pm to 4 pm. There are a number of events planned including a parade, stage presentation, performances from local performers, special recognition of military veterans, and the winners of the essay contest. Following in the tradition there will be free cake and ice cream. And for those who are a little more hungry there is a BBQ lunch available for a niminal fee. Just as in past years, there will be free flags available for you to wave and show your patriotism! As with tradition, each year there is free cake and ice cream served! Make a difference in this years event and consider sponsoring the celebration! For information on how to become a sponsor click the button below or visit the sponsorship page.